We spend a lot of time out in our covered patio. It’s a great way to get fresh air, enjoy the scenery, and just feel a little slower paced in this busy life we live. 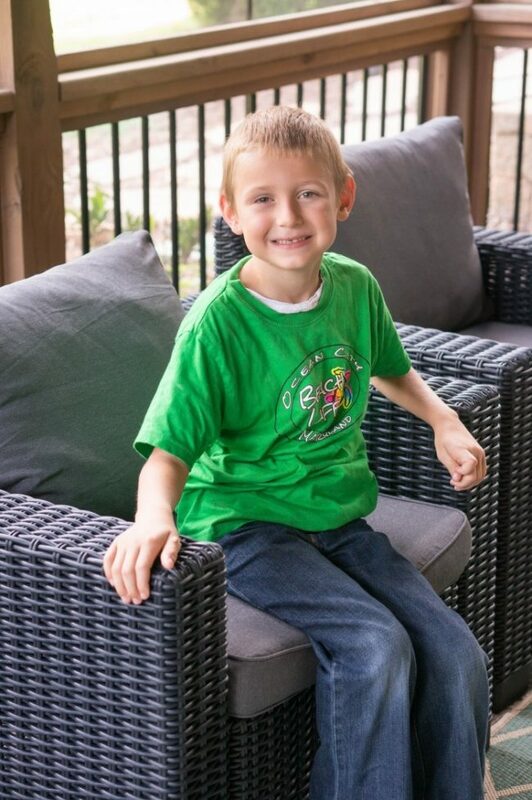 We really enjoy entertaining out back, barbecuing, and having friends and family over to celebrate summer with. To make the most of our backyard space, use these 10 simple ideas to make a big impact and spruce up your patio just in time for summer entertaining. I received samples from Keter in exchange for this post. All opinions are my own. 1. Set-up Good Lighting – Good lighting can transform your space into something magical. String lights, use tiki torches, or add candles to set a mood. We made simple table lamps using a mason jar and battery powered string LED lights. 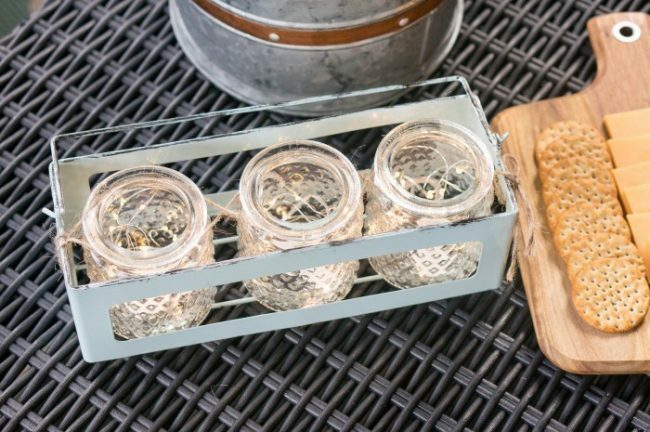 Just wind your string lights spiraling inside of the mason jar and turn on, when in use. 2. Make an Outdoor Dining Experience – Have a set of dinnerware ready for your outdoor dining, and use it often. I like using inexpensive melamine plates as they can add lots of color, they won’t ruin the party if they break, and it’s easy to hold onto a pile of them so you have plates ready for entertaining. 3. Turn-up the Tunes – Set-up outdoors speakers or bring a portable speaker along to add some tunes to living up your space. You can start a summer playlist of your favorite tunes to play all summer long. Then in years to come, every time your family hears the familiar tunes you’ll be taken back to a summer full of memories spent outdoors together. 4. Use a Splash of Color – Adding color can liven up the space. 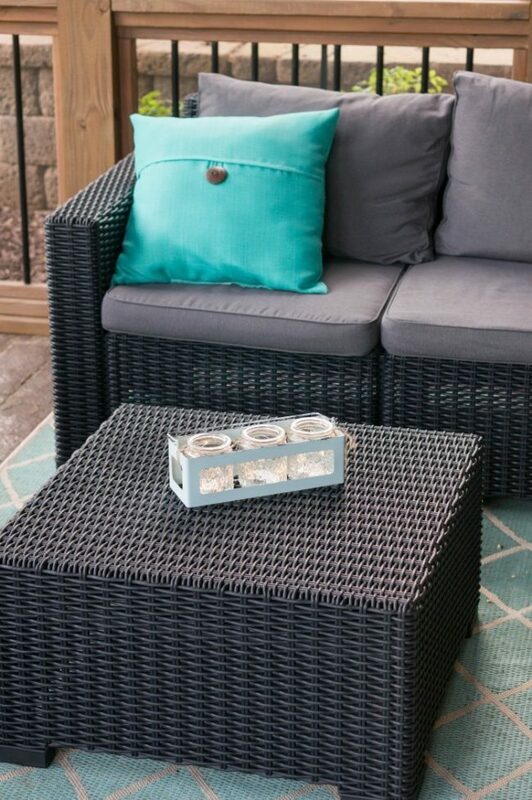 Spruce up your patio furniture set with some colorful pillows and fun lamp shades to give a bright pop of color that bring an energy to your patio. 5. Add Texture – Use a variety of fabric, pull in metal accessories, or even use a bit of burlap for varied textures throughout your space. You can even add curtains to enclose your space to create an intimate setting. Or, add unique art pieces to give the area interest. 6. 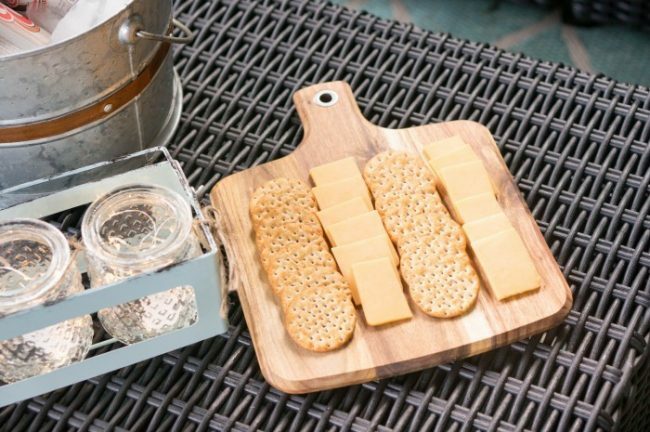 Use a Serving Tray – A beautiful, and multi-purpose, serving tray can double as a centerpiece and as a really easy way to bring out drinks or snacks to enjoy while you’re outdoors. 7. Make the Most of Storage – A matching storage bench can add additional seating in a pinch and give you a place to protect your furnishings when the weather turns. You can store your lighting or other fragile pieces away here when not in use. 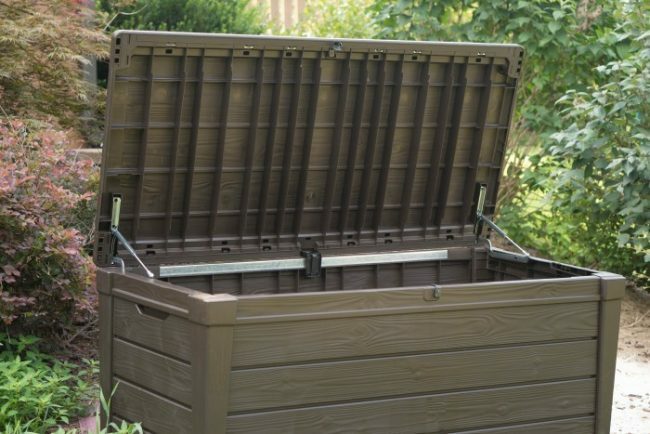 Pictured here is Keter’s Brightwood Storage Box. It’s huge, with plenty of room for all the backyard toys, storage for your patio furniture cushions, or a place to stash your backyard entertaining supplies. 8. Add a Flower Planter – Greenery or floral can really enliven a space. Surround your patio furniture with flowers to make you feel like you’re getting away from the hustle. Or add a small succulent to your table top if you’re limited on space. 9. 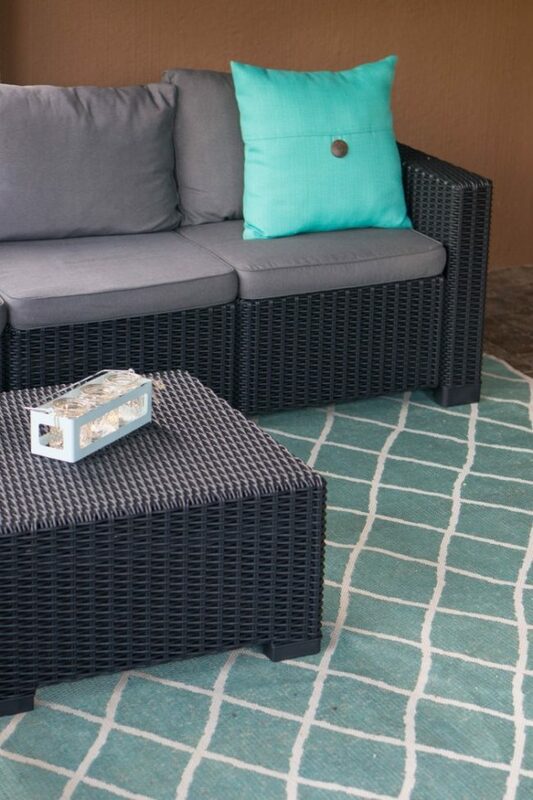 Throw Down an Outdoor Rug – An indoor/outdoor rug can make the backyard really feel like an extension of your indoor space in seconds! It will also give a lot of color to your the patio. 10. Add Lots of Seating – A chair or two won’t do it, you need lots of seating to create a space where people can congregate and visit together. 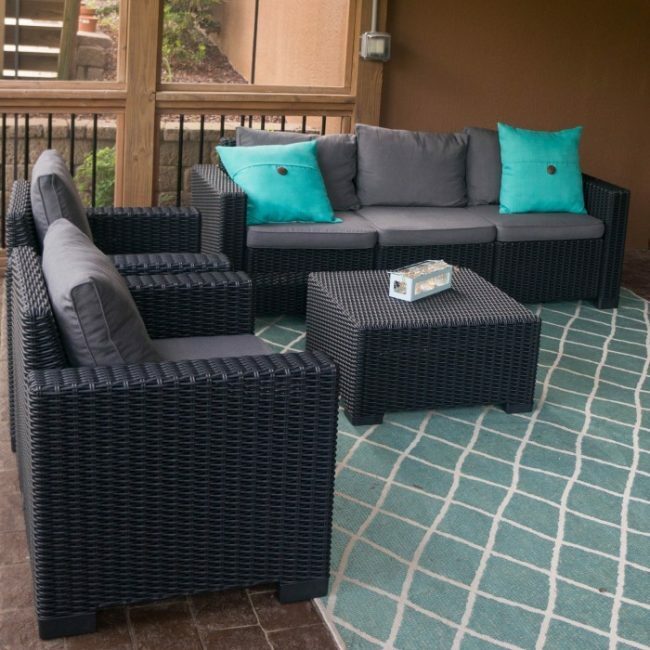 Choose a outdoor patio set with a sofa or loveseat and two arm chairs to add space for everyone. As a family of 6, having a 3-seater sofa was key to making enough room for everyone in the family. We were thrilled to partner with Keter to try out their California Set which includes a three-seat sofa, two armchairs, and an accent table. 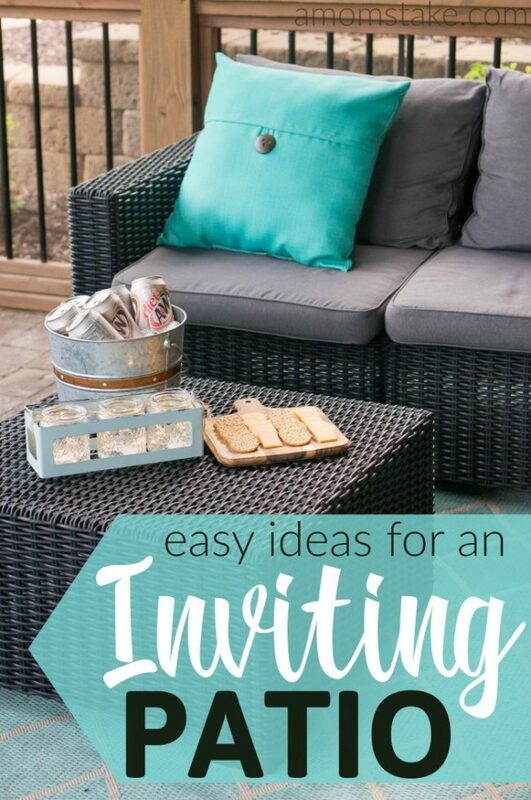 It’s everything you’ll need to get started creating that inviting patio space for your outdoors. The seats have a low back style which makes it nice for still seeing out when they’re not in use and with the deep seats they’re really comfortable! We have a nice covered patio area underneath our upper deck right outside our basement door. It’s the perfect place to hang out in the summer as it’s shaded, has a ceiling fan, and keeps the mosquitoes away. We will hang out in our patio space for family night or even just my husband and I as a place to have a date night in without feeling like we’re just at home. 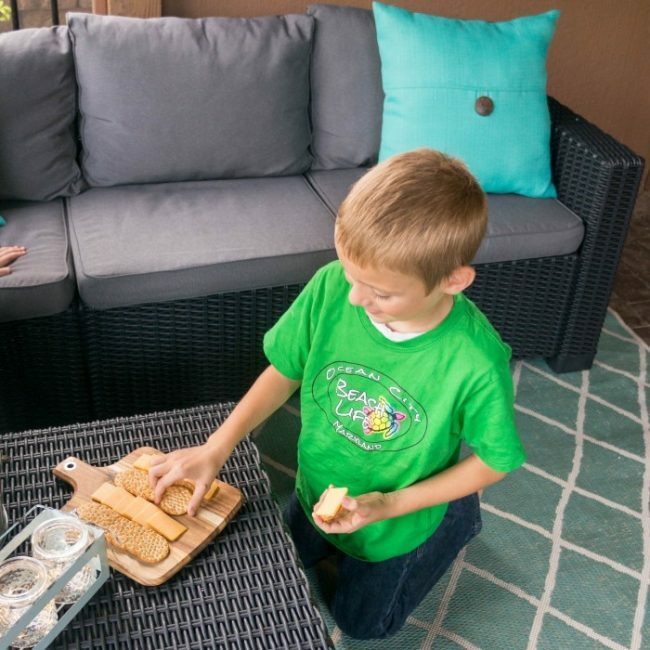 We’re really enjoying our California Lounge patio set. It has what looks like a wicker design, but without the fray that eventually breaks down. It’s crafted from a durable resin and is both weather resistant and UV protected to help the furniture stay looking great for years to come. I put the entire set together myself with the help of a kid or two rotating in from time to time to help. It was easy to put all the pieces together and the entire set was ready to use in about an hour. 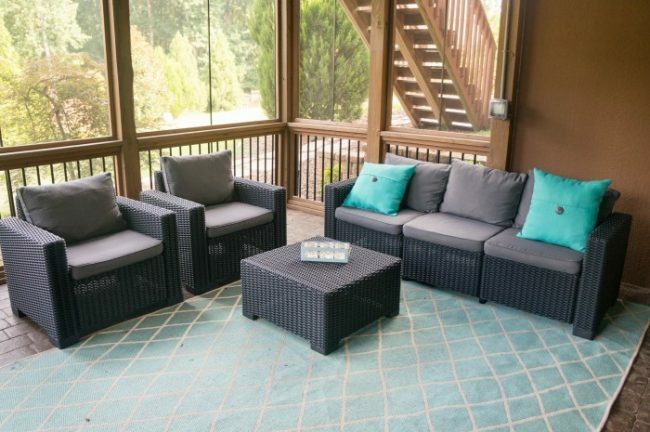 Check out all of Keter’s collection of Deep Seating Lounge Sets to get your patio space ready for entertaining this summer! Your patio looks great! Loving the pops of color you used, it really does look inviting. What a lovely patio area. I really like the pops of color you get from the pillows and the rug. Very creative set up. I love the outdoor furniture. The teal accent pillows are my favorite. That is the color my whole home is in almost! what a beautiful outdoor space to hang out in! I wish I had a patio! I really am excited because the house we bought actually has a patio now. I would love to buy that storage thing for it! I love the look of this furniture. We just finished building our new deck. Now I need to get some pieces for it. I need one of these rugs for sure. Oh so so nice. What a lovely outdoor space to just hang with our family. My patio needs some serious lighting upgrades. I’d love to make it more of a comfortable area to hang out! Your patio set is amazing! We are moving into new house at the end of the year. It has a nice deck and it will need new furniture. This would be great! These ideas are perfect for us in Southern California year round. We sometimes spend the cooler months off-summer more on the patio than in the heat of July and August. I love your ideas and the furniture is lovely! Believe it or not this is exactly what I am looking for. My patio is boring and I’ve been trying to find ways to liven it up. I love exactly what you did here. I might just copy it all. I would love to redecorate my deck. I love those pillows. These are great tips. All it takes is a few touches to change the entire look of your space. There’s no need to get crazy!